There is nothing like a lovely package of goodies through the post to cheer you up! As the weather gets colder, bugs and virus start spreading through schools and workplaces and last week I was struck down with the flu and confined to bed a for a few days feeling rather sorry for myself. 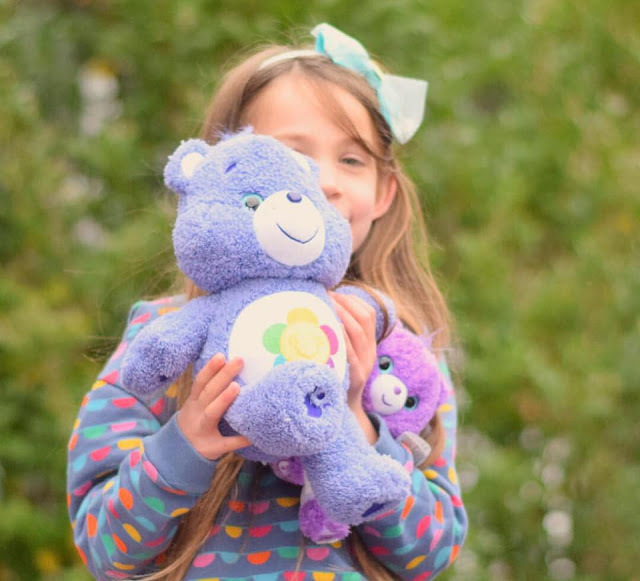 This made it especially good timing to receive a lovingly put together care package from Flair to help promote their Care Bears range. I was a child of the eighties and I was a major Care Bears fan when I was small so I was delighted to be able to share this long time love with my seven year old daughter! After school she came to give me a get well snuggle and we had a look through the lovely care package. 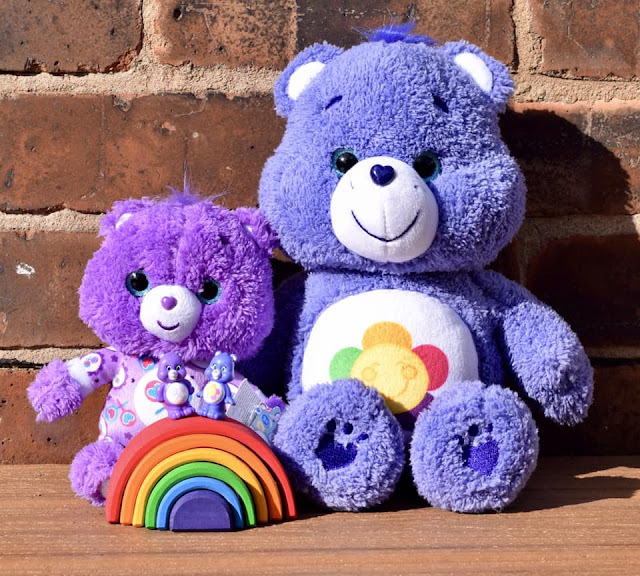 Inside we found the 13" Care Bears Harmony Bear Medium Plush which is available from ASDA, Tesco, Amazon and Debenhams with an RRP of £15.99. This adorable teddy is the perfect size for cuddles and is super soft with a very cute tuft of hair making it even more huggable! 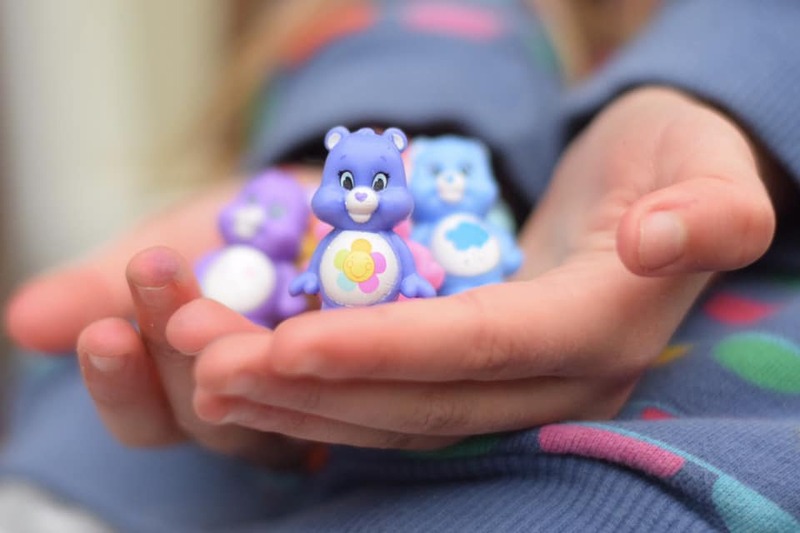 Joining Harmony Bear in the box was a smaller but equally as cute Care Bears Cub Share Bear plush which is just 8″ tall and is a perfect as a treat or special gift as it retails at just £7.99 from ASDA and Amazon. The Care Bears Cub plush wears PJs so is all ready for taking to bed and is ideal as a night time cuddly companion for any Care Bears fan! Just as I thought I had lost my two new Care Bears to my daughter, she spotted something else hiding away in the package! 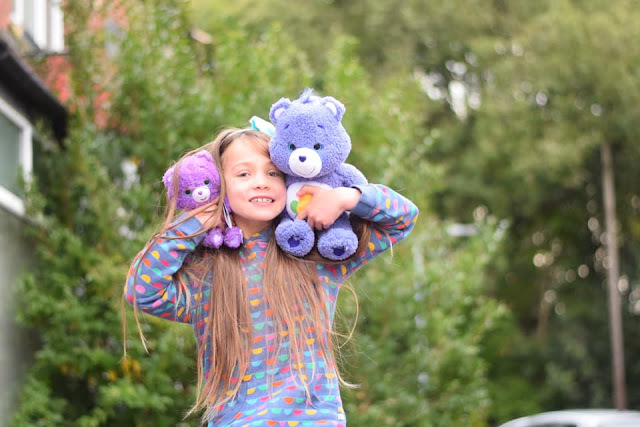 Like a lot of seven year olds, she is a huge fan of Squishies and Squishems at the moment, so she squealed with delight when she saw the pack of Care Bears Squishems! The pack contains 8 Squishems, 6 of these can be seen through the packaging and another two are mystery figures, hiding behind little white clouds. 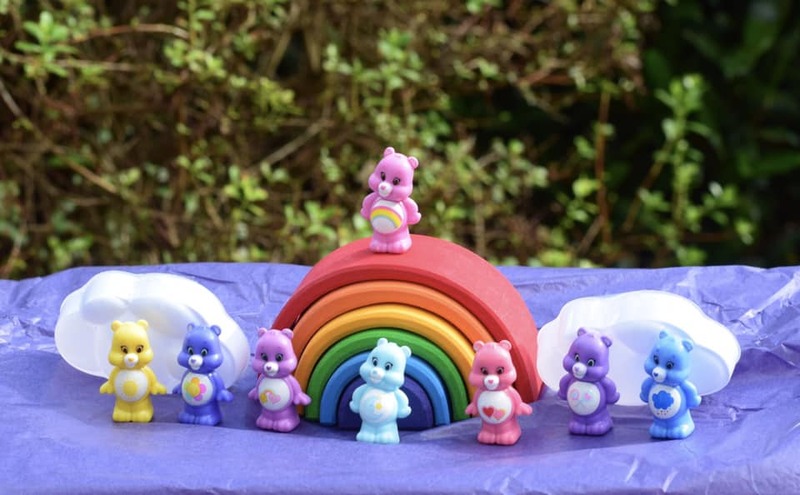 The Squishems figure pack has an RRP of £14.99 from Amazon, which is less than £2 per figure, great for imaginative play or just creating a rainbow display, these squeezeable figures feature all your favourite Care Bears characters in a fun squishy material! 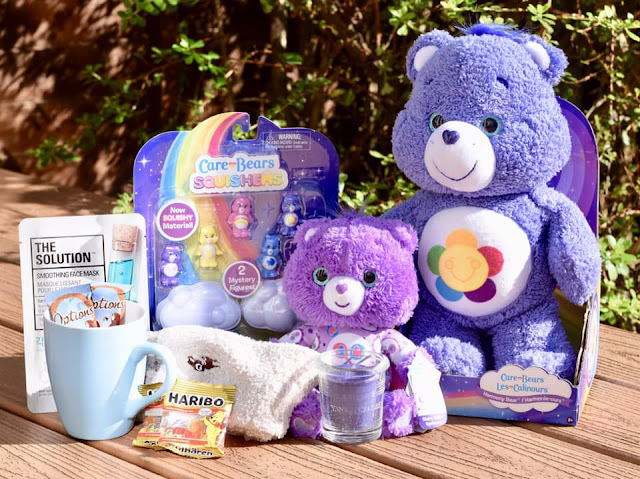 In addition to the selection from the Care Bears toy range, Flair treated me to all the ingredients for a perfect evening of pampering, including, hot chocolate, a face mask and a beautifully scented candle to relax in the bath with! I think these Care Bear friends will be very popular this Christmas! 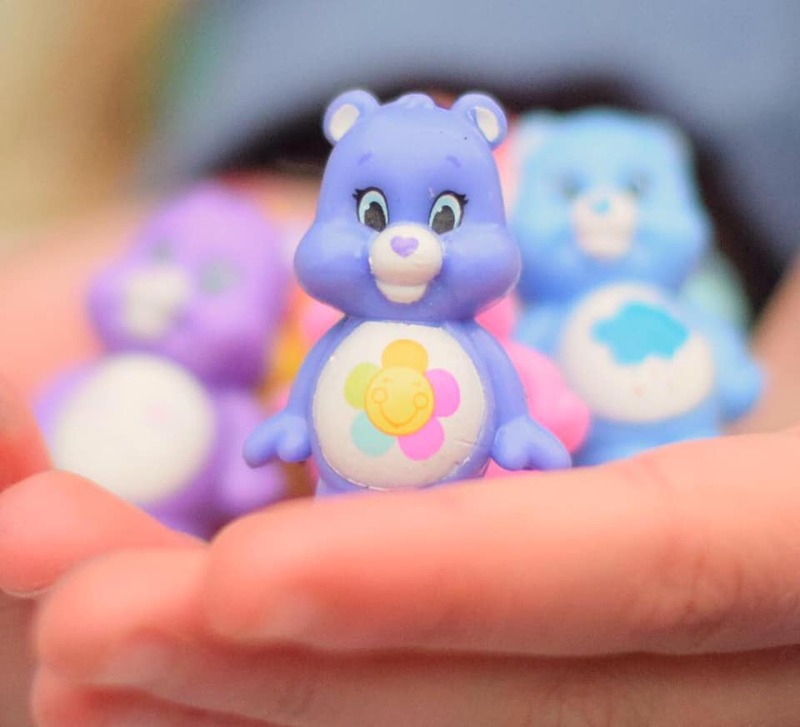 Do you have a favourite Care Bear?